University and research libraries worldwide, especially those with collections in the social sciences. 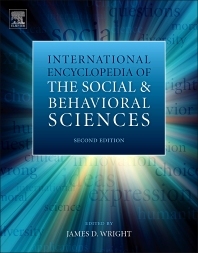 Institutions and infrastructure of the Social and Behavioral Sciences (H. Anheier). History of the Social and Behavioral Sciences (C. Fleck). Ethics of Research (D. Feinholf, I. Callies, T. Bikson (deceased)). Biographies (J.-C. Marcel, A. Hess, D. Barrett). Statistics (Q. Fu, X Guo). Mathematics and Computer Sciences Applications(P. Bonacich). Logic of Inquiry and Research Design (S.L. Morgan). Evolutionary Sciences (A. Mesoudi). Genetics, Behaviour, History and Society (G. Cabana). Behavioral Neuroscience (B. Kolb). Cognitive Neuroscience (S. Cappa). Psychiatry (D. Bhugra). Health (J. Siegrist, C. Vogele). Gay, Lesbian, Bisexual and Trans-sexual Studies (D.C. Barrett). Religious Studies (D. Sherkat). Environmental and Ecological Sciences (M. Fischer-Kowalski, H. Rau, K. Zimmerer). Science and Technology Studies (M. Lynch). Area, Development and International Studies (J. Hass). Studies of the Life Course (M. Mills). Sexuality (L.Waite). Labor Studies (K. Zimmermann). War, Peace, Violence and Conflict (S. Malesevic). James D. Wright received his bachelor’s degree in philosophy from Purdue University in 1969, a master’s degree in sociology from the University of Wisconsin in 1970, and his PhD in sociology from Wisconsin in 1973. His first academic appointment was at the University of Massachusetts, Amherst, where he was promoted to Associate Professor in 1976 and to Full Professor in 1979. Most of his fifteen years at Massachusetts were spent as Director, Associate Director or Director of Research in the Social and Demographic Institute. Wright left Massachusetts for Tulane University in New Orleans in 1988 where he served as the Charles and Leo Favrot Professor of Human Relations in Tulane’s Department of Sociology. He also enjoyed a courtesy appointment in the Tulane School of Public Health, Department of Biostatistics and Epidemiology. He left Tulane in 2001 to become the Provost’s Distinguished Research Professor of Sociology at the University of Central Florida. In 2003, he was named as the Director of the University’s Institute for Social and Behavioral Science and in 2013 was designated as a UCF Pegasus Professor, the University’s highest faculty honor. Wright was the Editor in Chief of the scholarly journal Social Science Research from 1978 until 2014. His previous editing experience also includes a twenty-year stint as editor of the Aldine de Gruyter book series Social Institutions and Social Change, two editions of the Handbook of Survey Research (Academic Press, 1983; Emerald Publishing, 2010), and service on the editorial boards of numerous journals. He is the author of 21 books and scholarly monographs on topics ranging from homelessness to research methods to NASCAR, and he has published more than 300 journal articles, book chapters, reviews, essays and polemics. Wright lives with his wife Christine Stewart and their multiple dogs and cats in Winter Springs, Florida, where in his spare time he likes to cook fancy meals for large crowds.